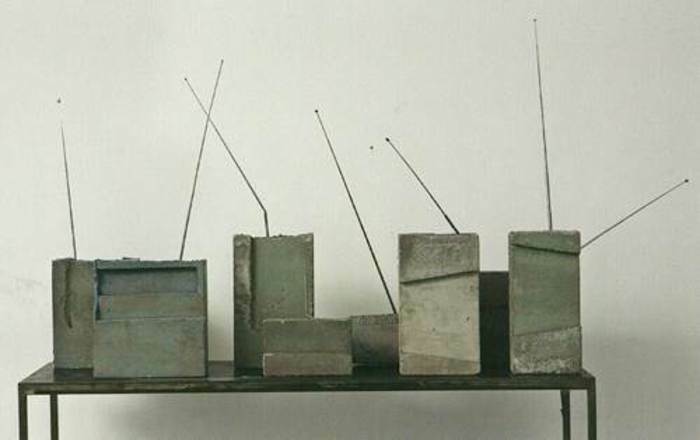 2015 | Museum of Contemporary Art Chicago, Pop Art Winter: "Pop Art Design" and "The Street, The Store, and the Silver Screen: Pop Art from the MCA's Collection"
Isa Genzken, Weltempfänger (World Receiver), 1982, Multiband radio receiver, 14 9/16 × 20 1/16 × 7 7/8 in., Collection the artist. © Isa Genzken, Courtesy the artist and Galerie Buchholz, Cologne/Berlin. The Museum of Contemporary Art Chicago—in partnership with the Museum of Modern Art, New York, and the Dallas Museum of Art—presents the first large-scale American retrospective of Berlin-based, German artist Isa Genzken, one of the most influential female sculptors of the past thirty years. 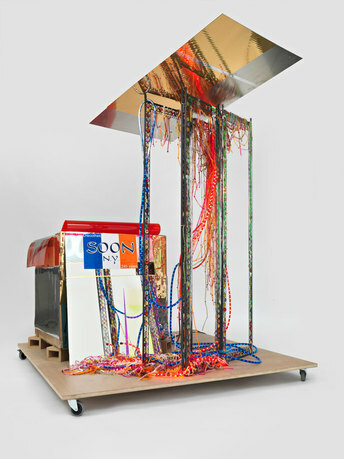 Isa Genzken: Retrospective encompasses the artist’s work in all media, produced over the past three decades. Many of the works in the show—which includes not only three-dimensional objects but also paintings, photographs, collages, artists’ books, performances, films, and public sculptures—are on view in the United States for the first time. 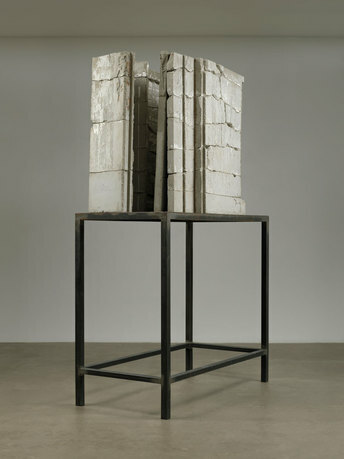 Divided into chronological sections and arranged thematically within those sections, the exhibition presents major works and series as nodal points that signal new phases or chapters in the artist's oeuvre. 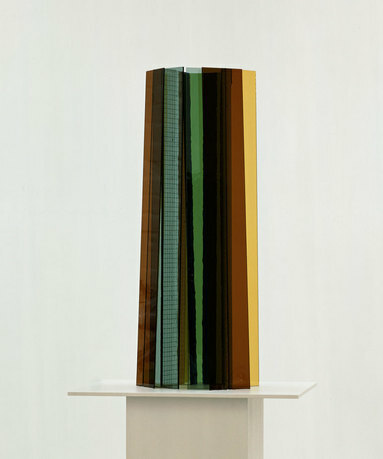 Together with the accompanying catalogue tracing Genzken's influence on an international array of sculptors working today, the exhibition secures Genzken's legacy as a transgenerational force in international contemporary art. Isa Genzken’s works express an attraction to that which surrounds and shapes our everyday lives, from design, consumer goods, and the media to architecture and urban environments. Her interest lies in the way in which common aesthetic styles come to illustrate and embody political and social ideologies. Her diverse practice draws on the legacies of Constructivism and Minimalism and often involves a critical, open dialogue with Modernist architecture and contemporary visual and material culture. Using plaster, cement, building samples, photographs, and bric-a-brac, Genzken creates architectonic structures that have been described as contemporary ruins. She further incorporates mirrors and other reflective surfaces to literally draw the viewer into her work. As part of her deep-set interest in urban space, she also arranges complex, often disquieting, installations with mannequins, dolls, photographs, and an array of found objects. Born in 1948 in Bad Oldesloe, Germany, Genzken lives and works in Berlin. As the Museum of Contemporary Art Chicago’s James W. Alsdorf Chief Curator, Michael Darling has organized several exhibitions, including Pandora's Box: Joseph Cornell Unlocks the MCA Collection (2011); The Language of Less (Then and Now) (2011); IAIN BAXTER&: Works 1958–2011 (2011); Ron Terada: Being There (2011); and David Hartt: Stray Light (2011). 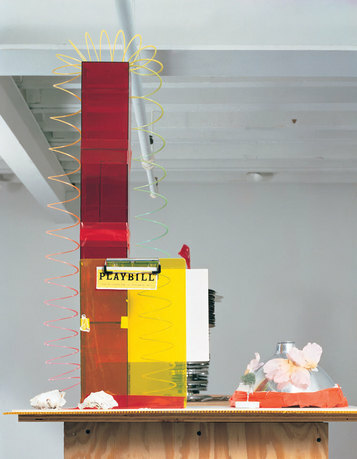 Previously, Darling played a pivotal role at the Seattle Art Museum, after being recognized for his work at the Museum of Contemporary Art, Los Angeles. Darling's writing has been published in Frieze, Art Issues, Flash Art, and LA Weekly. He received a BA in art history from Stanford University, and an MA and PhD in art and architectural history from the University of California, Santa Barbara. Sabine Breitwieser is the newly appointed director of the Museum der Moderne-Rupertinum in Salzburg. From 2010 until the end of January 2013 she was the chief curator of Media and Performance Art at The Museum of Modern Art in New York. From 1988 until 2007 she was the founding director and chief curator of the Generali Foundation in Vienna. Since 2004 she is a board member of CIMAM, the International Committee of ICOM for Museums and Collections of Modern Art. Laura Hoptman is a curator in the Department of Painting and Sculpture at The Museum of Modern Art in New York. She returned to MoMA, where she had previously served as assistant curator (1995-2001), after holding the positions of curator and head of the Department of Contemporary Art at the Carnegie Museum of Art in Pittsburgh (2001-2006) and senior curator at the New Museum of Contemporary Art in New York City (2006-2010). Founded in 1967, the mission of the Museum of Contemporary Art Chicago is to be an innovative and compelling center of contemporary art where the public can directly experience the work and ideas of living artists, and understand the historical, social, and cultural context of the art of our time. The Museum boldly interweaves exhibitions, performances, collections, and educational programs to excite, challenge, and illuminate our visitors and to provide insight into the creative process. The MCA aspires to engage a broad and diverse audience, create a sense of community and be a place for contemplation, stimulation, and discussion about contemporary art and culture.